A free weekend in the middle of June. June! 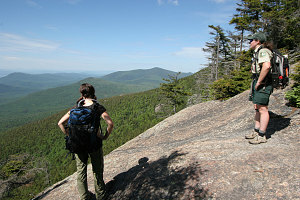 Wow, how the months fly by -- and we definitely haven't yet done as much White Mountains hiking as I would have liked. So... New Hampshire it is. 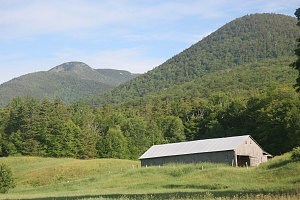 The plan is a blockbuster full-weekend four-peak outing, with the first day being mounts Whiteface and Passaconaway, in the southern Whites, and the second day north and east to the Carter Range. 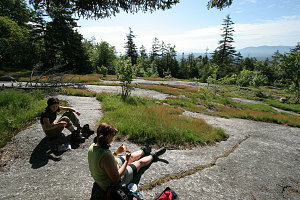 We joined Caroline for this weekend's hikes. 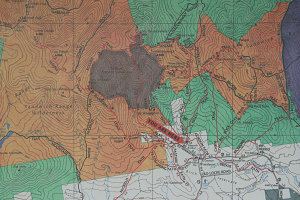 Our objectives aligned nicely: these four peaks were all on our 4000-footer to-do lists. 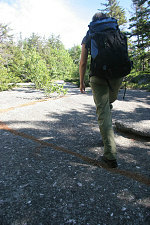 Caroline went down a little before us to secure a campspot at White Lake State Park, not far from the start of our Whiteface and Passaconaway hike. 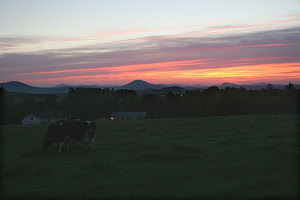 The weather was pleasant but a bit humid, and the forecast was a mixed bag. We would have to keep an eye on the sky throughout the weekend. 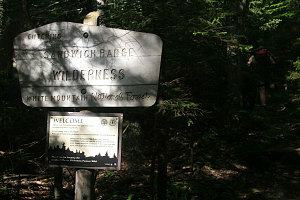 We chose to do a loop hike that encompassed both Whiteface and Passaconaway. 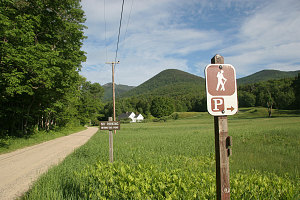 The trailhead for this loop hike is the Ferncroft Parking area, situated close to the sharp corner that highway NH113A makes as it skirts the southern White Mountains. 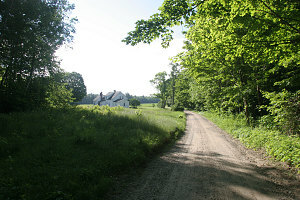 The parking area is set amidst beautiful grassy fields. 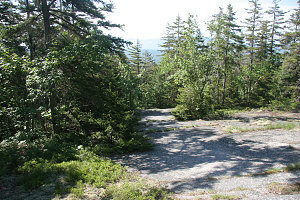 The land immediately surrounding the parking area is private, and one must walk through right-of-access points in order to get into the White Mountain National Forest and the trails. It is a beautiful, clear and warm morning. 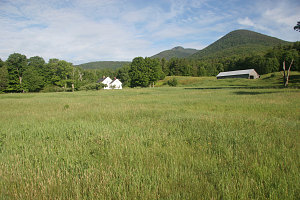 From the open grassy fields, we can clearly see our first quarry: Whiteface Mountain. 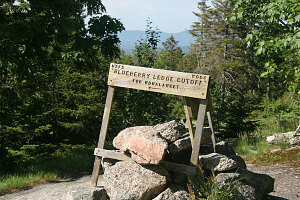 The route we are taking is called the Blueberry Ledges trail, and, according to the description, promises to be scenic and fun. 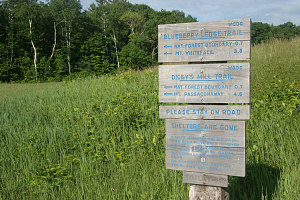 From the parking area, we walk along some gravelly back roads (with directions to trails well-signed), to the start of the Blueberry Ledges trail. 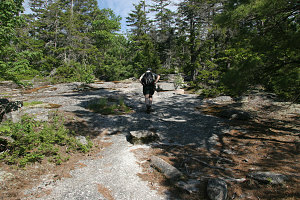 The trail starts up quite gradually, and the going is easy. 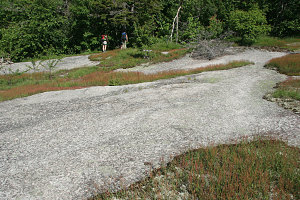 After a while, we start to emerge onto the 'ledges' of the Blueberry Ledges trail. These are more like open slabby areas than ledges, but still, they are pretty, and its nice to be able to have open space once in a while while hiking. 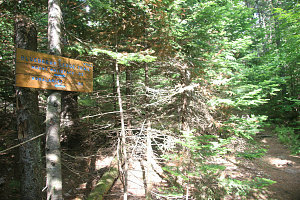 Along this section we meet a United States Forest Service Ranger, Karen. She is quite chatty and cheery, and becomes our hiking companion for the remainder of the ascent up Whiteface. 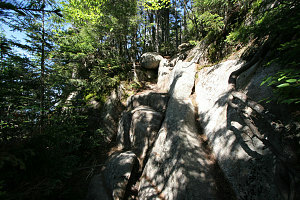 The upper part of the route becomes much steeper, with lots of fun rock steps, requiring scrambling. 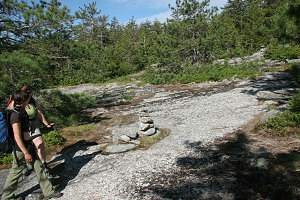 The route follows a narrowing ridge, and there are excellent lookouts from each side of the ridge as the trail winds its way up it. 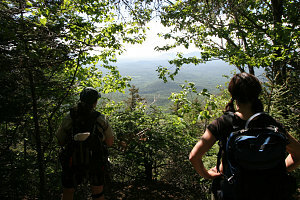 There are views to the sea of green to the low-land south, and there are views north to Passaconway (one of our objectives today) and to the distant Presidentials. 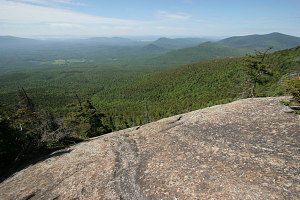 Chocorua, a rocky open lower peak, is prominent to the east.